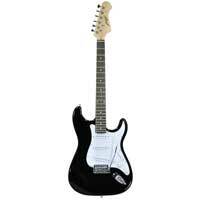 Electric Guitars are always popular no matter the current trend in music. Now more affordable than ever and in popular well known designs there's no reason not to get yourself one and start what will be a lifelong passion. We have some lovely high quality beginners Electric Guitars from Johnny Brook that are a joy to play and perfect for students, schools and anyone that's looking for their first real electric. Johnny Brook guitars feature maple neck's with rosewood fretboards and tremolo systems just like the expensive brands, these are amazing value and quality. Available in several colours such as the iconic Classic Red or full the complete beginners package we have sets such as this Vintage Blue Kit which comes with matching 20W blue practice amplifier, carry bag and accessories.